Engrossing, lovely to look at and with a potentially healthy shelf-life, if the multiplayer gets a toehold and gels cross-platform. 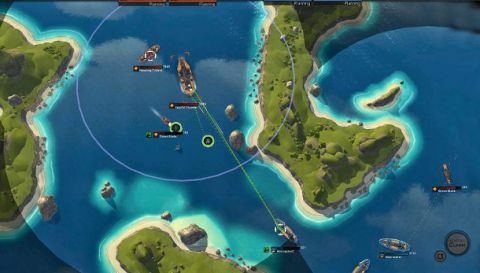 On an internet of visual chaff capable of eliciting millions of disingenuous LOLs, the ' jazzy trailers ' for Leviathan: Warships stood out as being authentically amusing and intriguing teasers for this top-down, turn-based naval strategy game. The good news is that Paradox Interactive have, with their usual creative flair, produced something that's as entertaining as its advance publicity augured. "With its handsome menus and lean interface, the game's appeal is immediate"
With its handsome menus and graphics and lean interface, the game's appeal is immediate. A brief tutorial paves the way for the nine mission campaign, where the real learning takes place (though many may dive straight for multiplayer). It has you commanding a fleet in the Commonwealth Navy operating in a fictitious world full of florid names, where your objectives have the ring of a public health notice: 'Destroy the Chlamydia', that sort of thing. Victories lead to a trickle of upgrades that boost your fleet's firepower, stealth capability and resilience. Turns have planning and outcome phases. The former (time-limitable in multiplayer) is used to move and micromanage weapons systems for each vessel in your fleet to optimise offensive and defensive capabilities. Click 'commit' and the ten-second outcome phase begins with your, and your opponent's, actions playing out in real time. When the time runs out the action freezes and the planning phase starts again. Strategy-wise, a calculated approach makes for a more satisfying experience rather than rushing in headlong, but both methods have their applications. Customisation takes place in your shipyard, where you can enhance or swap out vessels and arms, keeping an eye on their respective point values to ensure you don't exceed the proportional limit dictated by the size of the battle. Your fleet initially resemble ironclads, but can be futureproofed with railguns, beamguns, rockets, decoys, radar, shields, cloaks and so on. All of the above are immediately available in multiplayer, where this game shines. The campaign, five challenge and two versus modes, can be played cooperatively by up to four players on a dozen maps. These are mostly archipelagic, creating some obvious choke points, but provide few places for campers to hide. Overall the art style is crisp and uncluttered – useful for when maps do become congested in battle, as plotting your fleet's next moves requires methodical analysis of the information radiating from each vessel on screen. Hopefully servers will now be easier to access and busier than they were in the week following release. To pinch a land-based military phrase, perhaps with World of Warships still on the slipway, Paradox Interactive hope to steal a march on Wargaming.net and establish a loyal player base with this absorbing game. And if this isn't a paradox, with Leviathan: Warships they appear to be on fairly solid ground.